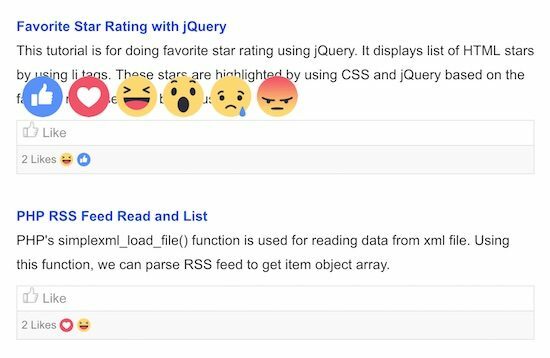 Facebook like emoji rating is one of my favorite feature which can be a very useful gimmick for a web page for sure. It is especially for collecting the user’s emotion when they add rating or likes. In this tutorial, I am going to simulate this feature with a PHP example using jQuery AJAX. In this example, a list of records is displayed from the database. Each record contains an option to the user to add likes. On hovering the “like” option shown on the example page, the emoji icons will be pop over to add the likes by sharing emotions. The add or update user likes are done via AJAX to provide a smooth and trendy feel to the user while sharing their emotions and likes. By clicking the emoji icons, the emotion data and the row ident will be sent to the PHP code via AJAX to update the database. The likes count and the unique emotions are collected from the database and displayed on each row. After performing the AJAX add/update action, the UI will be updated with the latest emoji rating without page refresh. In this example, I have used tbl_tutorial data to be displayed dynamically on the landing page. This table contains 3 records with the tutorial name and description on each. For each row, a like option will be displayed. On hovering the like option, the emoji icons will be displayed. 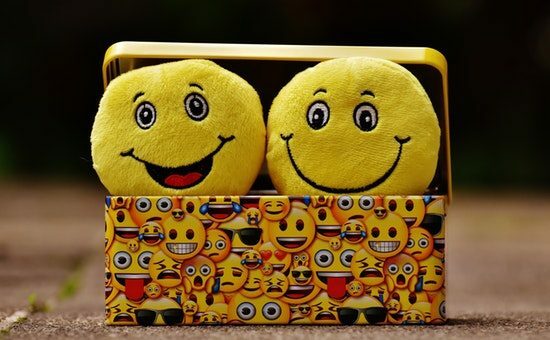 By clicking a particular emoji icon, the corresponding emotion data will be posted to the PHP via AJAX. Previously, we have learned how to create a PHP comments system to post text comments with emojis. In this example, the user interface will have the stored emotion data for each record on page load. And, this data will be updated via AJAX on each like action performed by the user. // Here the member id is harcoded. <li><img src="icons/<?php echo $icon; ?>.png" class="emoji-icon"
This script shows the jQuery functions created for show/hide emoji icons on the mouse movement with respect to the “like” element in the UI. Also, it contains the function to perform the add/update emoji rating via AJAX. The showEmojiPanel and hideEmojiPanel functions are called on the mouse-over and mouse-out event of the “like” text link which exists on each row. These functions invoke the jQuery show hide to toggle the emoji icon container element. On clicking the emoji icons, the addUpdateRating() function is called. In this function, the AJAX request will be sent to the PHP. The AJAX method calls the addUpdateRating.php by posting row ident and emotion data as the parameters. After successful AJAX flow, the success callback will receive the response from the server-side to update the UI. In this example, it receives the Likes Count and Distinct emoji icons in HTML format. In this PHP code, the AJAX request is received with the posted parameters tutorial_id and emoji_rating. In includes the PHP Rate.php class to invoke the function to read and update the rating database. In this code, getRatingByTutorialForMember function read the database result to check if the user already added the likes for the tutorial. If not, a new record will be added to the tbl_member_rating table by invoking the addRating function. If there is already an entry on the rating database, then the member rating will be updated. After performing the add or update the rating count and emotion data are formed in a HTML format. This HTML data will be sent to the response of the AJAX request to update the UI. In this example, I have created two PHP classes for accessing and performing database insert or update on the rating table. The Rate.php class contains functions to create the database query and form query param types and value array. The DBController.php class will take care of establishing the connection and prepare required query statements to perform database related operations. This file contains functions to get all the records from the database with rating data. The getAllPosts function uses a left join query to get the tutorial and its rating data. The group_concat function is used to get the collective, distinct emotion data from the database. It also contains the functions to get the tutorial database by member id and to get the rating data by tutorial id. The addRating and updateDating functions form the posted rating data and type in an array format. This array will be used to bind the param array with the query statement on DBController class. Below SQL script is used to run this example in your PHP environment. Import this script by using database client like PHPMyAdmin, SQLYog and anything else. The following screenshot shows the output of ths example simulating the Facebook like emoji rating.